"I paint wildlife in oils and occasionally, watercolour, capturing the texture of the fur and the expression in the eyes. I love it when people say they feel they could reach out and touch the animal I have painted. Many of the animals I paint are predators, both feared and fascinating to many and often on the endangered list. I hope you will take a look through my paintings and prints, including some of the beautiful Shropshire landscape where I live"
Award winning wildlife artist Sue Payton tries to capture both texture and light in her paintings. After a number of years painting local Shropshire landscapes in watercolour and pastels, Sue took up painting in oils. At about the same time, she started to paint wildlife and immediately became hooked. . While she still paints the occasional landscape, she has painted mostly wildlife since 2013. She often finds herself drawn to paint endangered mammals, especially carnivores such as big cats, African wild dogs and wolves. Many of her paintings are detailed portraits, as she loves to capture the eyes and the texture of the fur. Sue has won awards for her paintings from both the Association of Animal Artist exhibitions and the National Exhibition of Wildlife Art. Sue has been self publishing her work for a number of years and produces both open edition and limited edition prints of her work. The use of a professional quality printer with pigment inks on treated watercolour paper ensures that the prints not only capture the subtleties of the original painting but if kept out of direct sunlight, the colours will stay vibrant for more than 70 years. 2013 – Started painting wildlife after 11 years of mostly painting local landscapes. 2014 – paintings accepted in to the National Exhibition of Wildlife Art Exhibition. 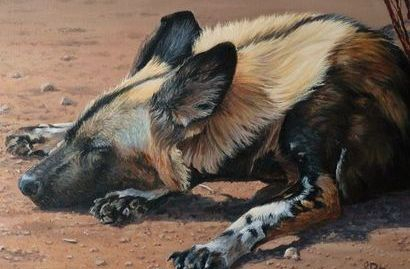 2015 – (April)Awarded winner of the Endangered Species category at the Association of Animal Artists annual exhibition by Pollyanna Pickering. 2015 - (Aug) painting accepted in to the National Exhibition of Wildlife Art Exhibition (sold within the first few days).